and the whisper there's still time. and strangers asking, "What's your name now?" who love you. You think it couldn't be. a shine from your new name. sifts down :the stars creaking into place. breaking the paint and door. the wrong sky.and the cloud has changed. from the sky thrown over its beak. for the faces, for this bare and peeling wall. into the wind, louder, louder. These poems are from Hands Collected 1949-1999 (2000) Trade Paperback. Limited Edition Hard cover. Pavement Saw Press. 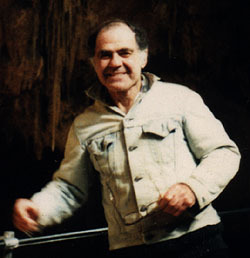 Photo of Simon Perchik (late 1980s) copyright © Evelyn Perchik, 1999.